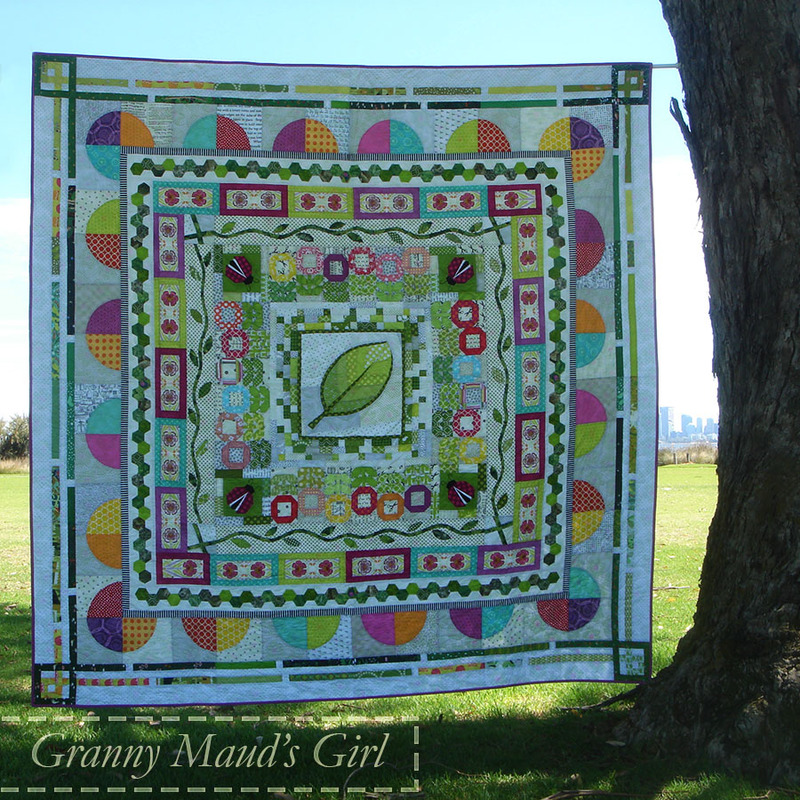 A couple of years ago, I took part in the 2014 New Quilt Bloggers Blog Hop. Registrations have just opened for this year’s blog hop, and I encourage anyone who has been blogging for fewer than three years to give it a go. Click on the button below, and you will go straight to Yvonne’s page where you can sign up. I found it a really worthwhile exercise. Reading other blog hoppers’ blogs introduced me to all sorts of creative people and ideas. Others also gave me constructive feedback about things I could improve on my blog. Overall, however, I think the two biggest rewards for me were the friends I made (both distant and local) and the Possum Magic round robin group that formed when eight Australians and New Zealanders decided to get together. That was fun! Here is a gallery of possumy highlights. Wouldn’t you want to sign up for something that could lead to this? The finished block, with its new border, is now ready to post to Jane. Serena was the brains behind the rounded corners, but I drew the pattern. I added a border of scrappy pinwheels, made up of 1¾-inch half-square triangles. It is now a whopping 76 inches square. I am really pleased with my finished block! I chose colours for the bullseye by studying the colours Jo had featured in the fletching of her arrow. This is what happens when a bunch of Australians and New Zealanders let their imaginations and creativity run riot in a quilting round robin, and it all started from the blog hop. I have also had a few personal swaps come out of the blog hop, such as the Puppy and Poppy swap I did with Yvonne. Go on. Join the blog hop. You will not be sorry. Thank you so much for sharing, Carla. I am so glad I took the leap and joined in 2014, and I really appreciate your perspective on that as well. The Possum Magic round robin group was such a fantastic off shoot that year! Sadly I don’t qualify as a new blogger any more, but I’ll head over there to see what I can learn 🙂 I’d forgotten how lovely all the Possum Magic quilts were, so thanks for showing them! That Round Robin is a gateway drug, for sure! I was all pleased with my decision to Bee Myself and I selfish this year, but maybe I’ll just take a teensy peek at the blog hop. What harm can it do?